Teaching Authors--6 Children's Authors Who Also Teach Writing: Write? Right! And, especially today, October 20, our National Day on Writing as declared by the National Conference of Teachers of English (NCTE). TeachingAuthors joins other Kidlitosphere bloggers in submitting this, our third post, to The Gallery A Lifetime of Reading, curated by Franki Sibberson and Mary Lee Hahn, two teachers who blog at A Year of Reading. Let’s hear it for Story, both written and read. It’s a technical wonder every bit as marvelous as any GPS; in fact, maybe even more so, to my way of thinking. Not only can story help pinpoint the reader’s and/or writer’s location in Life, determining where he is at any given moment; it can help illuminate where he’s been and might be going. Printed and bound, story is there for everyone to use, hand-held, heart-held, impervious to storms. Signal-sending story characters from time in memorial compute important date, cover to cover. No, not for me, the alluring, beckoning Gypsy-like voice of today’s GPS. I prefer the voices of my tried-and-true story favorites. 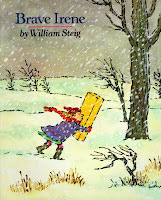 For instance, the poignant heart-ful tones of Brave Irene, William Steig’s Heroine who braves wind, snow and cold, not to mention steep terrain, to deliver to the Duchess, (in the nick of time, of course! ), the dress Irene’s mother had sewn for the ball. I re-read this classic picture book whenever I’m lost, accompanying Irene on her obstacle-strewn plotline. The burdensome box she totes provides her ticket out. Her foe, the wind, becomes her friend. Once again I pinpoint where I am on my journey. Once again I see where I’ve been and might be going. 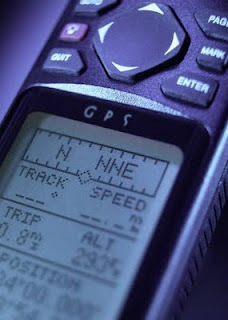 In honor of our National Day on Writing, let’s hear it for Story, the ultimate Global Positioning System!